Prelude and fugue in F# Mayor……………………………………………..J.S.Bach. Himno por un sueño……………………………………………………Yuri Sacristán. Born in Moscow in 1990. One year later Yuri and his parents moved to Madrid. His mother is russian and his father is from Spain. Since he was a child he showed a wide artistic and musical conception. He was interested in different musical genres: Classical, pop, film music and popular music from different countries. Yuri always has combined the regular studies of classical piano at the conservatory with his unofficial learning of other music styles and also with his developement as a composer, arranger and improvisator. In 2009 he entered in the Aragon Conservatory (Zaragoza, Spain). 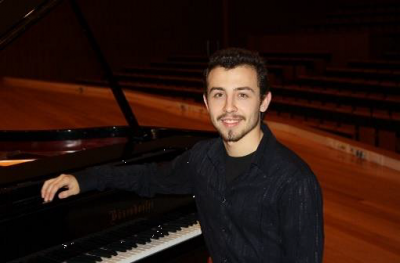 In 2013 he was accepted in the Rotterdam Conservatory for studying a Wold Music Master. There he specialized in Argentinian Tango but also he learned flamenco, cuban music and pop. During his dutch period, besides of his studies, he worked as dance accompanist at the Royal Conservatory of The Hague and also at the Roterdam Conservatory. In June 2015 he returned to Spain, where he teaches piano, continues learning flamenco and play concerts since then. Yuri has performed at many important concerthalls like Auditorio Nacional de Madrid, Casino de Madrid, Audirorio de Zaragoza, Conservatorio de Melilla and De Doelen (Rotterdam). During his studies he has taken lessons with teachers like Claudio Martínez Menher, Eldar Nebolsin, Miguel Ángel Ortega Chavaldas, David Kuyken, Josep Colóm, Kennedy Moretti, Nino Kereselidze, Alexander Kandelaky, Ramón Coll, Aurora López, María Antonia Rodriguez, Marina Manukovskaya, Coco Fernández, Wim Warman, Gustavo Beytelmann, Ricardo Mendeville Esperanza Martín and José Ramón Jíménez. 2002: – 1st Prize Hazen in the Teresa Berganza Conservatory. – 1st Prize in the III Musical Competition Intercentros. 2003: – 1st Prize Hazen in the Teresa Berganza Conservatory. – Scolarship Tertulia Musical Tomás Marco. 2006: – 1st Prize Hazen in the Teresa Berganza Conservatory. – 1st Prize Hazen in the Teresa Berganza Conservaotry. Chamber Music. 2009: – Scolarship Fundación Promete. 2010: – Scolarship Fundación Promete.